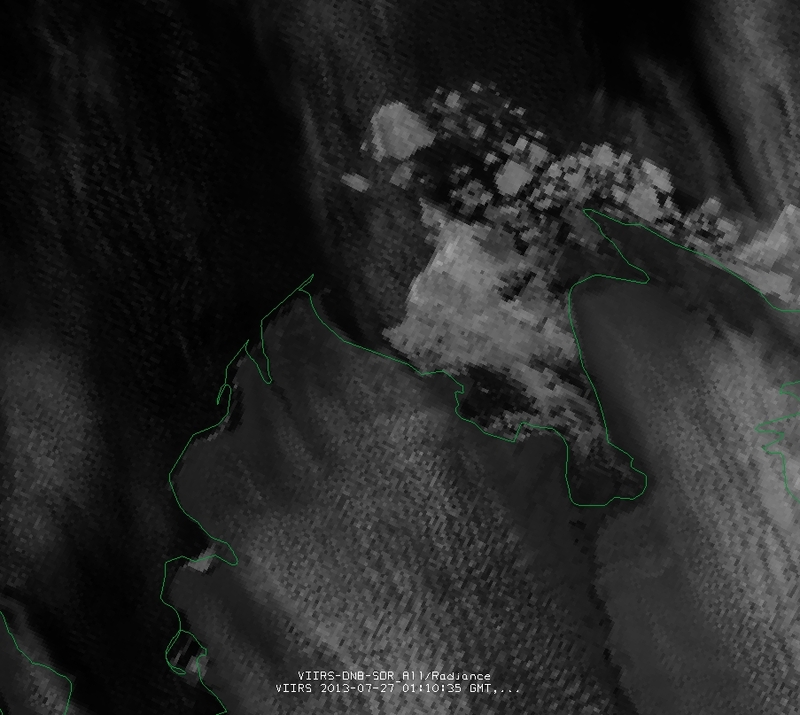 Satellite imagery reveals Russian military activity on the New Siberian Islands. For centuries, sea ice and forbidding conditions made Russia’s north coast all but impassable to foreigners. The Russian Empire worried about threats on its western, eastern, and southern fronts, but the northern front never really seemed vulnerable. The harsh climate was essentially its first line of defense in the Arctic. During the Cold War, however, the Arctic became a frozen battleground between the Soviet Union and the West. On both sides of the Arctic, militarization ensued. The Americans and Canadians built the Distant Early Warning Line across Alaska, Canada, and even into Greenland. This series of radars was meant to warn of any incoming incursions from the north. For their part, the Soviets built . After the collapse of the Soviet Union, demilitarization of the Arctic ensued, particularly in the Soviet Union. This development was not by choice: dreadful economic circumstances forced Russia to stop maintaining many of its military installations in the Arctic. The New Siberian Islands were one such place where Russia closed down its research station and a naval base for the Northern Fleet, which had been in operation from 1933-1993. The New Siberian Islands in relation to the rest of Russia. In September 2013, The Barents Observer reported that Russia had begun delivering new personnel and equipment to the old military site on Kotelny Island, the largest of the New Siberian Islands. Photographs from the Russian military of soldiers raising the tricolor over the barren tundra proved their point. In December 2013, The Aviationist explained, “Currently, an air traffic control service is present, along with accomodation, own water supply, a power station and heating. The airfield is not to be a minor one, since it will be able to accomodate landings of planes as large as Il-76 cargos.” Nine months later basically marked the ribbon-cutting ceremony. In September 2014, Russia Today reported that Russia officially reopened a military base on Kotelny Island after it had been closed for over twenty years. Still, due to a number of factors including Kremlin secrecy, poor reporting out of Russia, and a Western media that is inclined to report aggressive Russian behavior, it’s hard to say objectively whether or not a Russian military build-up is taking place in the Arctic. That’s where satellite imagery comes in handy. Since it shows phenomena on a larger scale than flags simply being raised, it can help reveal whether or not Russia is in fact building bases and increasing the amount of military infrastructure in its Arctic region. In Ukraine, for instance, satellite imagery was able to detect convoys of Russian vehicles opening up a new front. On the whole, useful satellite imagery in the Arctic is hard to obtain. The long periods of winter darkness make it all but impossible for the majority of satellites, which have sun-synchronous orbits (meaning they take images of the earth when it is lit by the sun), to produce useful data in the Arctic year-round. Moreover, even when the sun is shining, the thick clouds and storms prevalent in Arctic weather systems can obscure satellite imagery. But in the past two years, the availability of useful satellite imagery of the Arctic has improved dramatically thanks to the Suomi National Polar-orbiting Partnership (SNPP) satellite. Launched by NASA and NOAA in October 2011, SNPP can acquire data in a range of wavelengths, including the visible spectrum in its Day-Night Band (DNB). All of this imagery is available for the public to download. I’ve written about the wonders of the DNB before, which collects images of the earth at night. Anthropogenic lights from features like cities, gas flares, military bases, and ships all show up in stunning clarity in DNB nighttime imagery. SNPP passes over the North Pole every 101 minutes. That means it regularly flies over various parts of the Arctic from its orbit 824 kilometers above Earth. The high rate of frequency enables capabilities like ship tracking in the Arctic, as documented by researchers in a new paper published in Remote Sensing. In the image below provided courtesy of William Straka, a scientist at the Cooperative Institute for Meteorological Satellite Studies and the paper’s lead author, a nuclear icebreaker believed to be 50 Let Pobedy (50 Years of Victory), is seen making its way southeast. Straka had been tracking the ship for several days and watched it travel to Kotelny Island, where it possibly dropped off some material before leaving again (the actual cargo delivery was not visible in the satellite imagery, as it may have occurred while the satellite was not overhead). 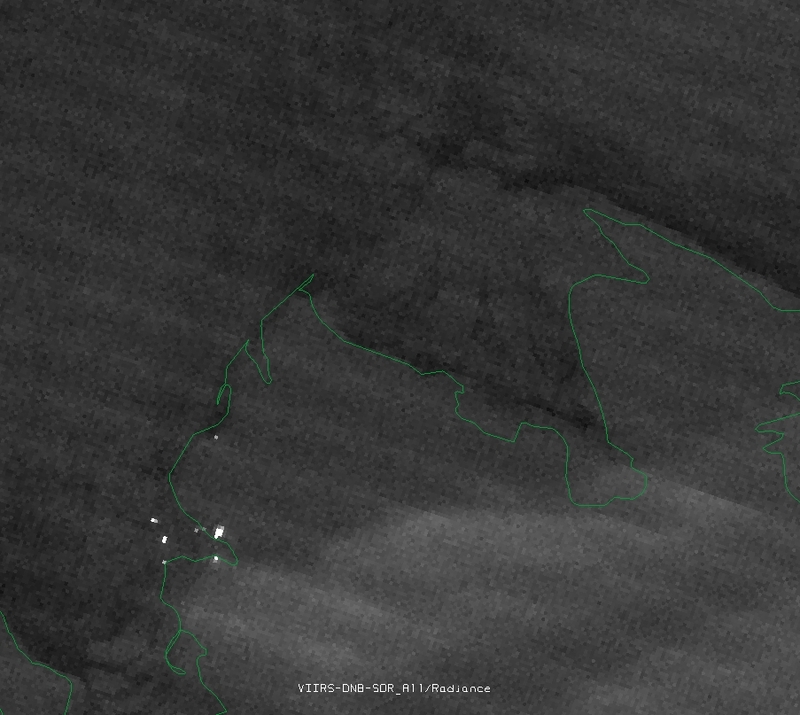 Night light images around Kotelny Island, just to the northeast of the area in the images Straka provided, reveal even more activity, as the time-series image at the very top of this post shows. The animated GIF includes an image taken approximately every 24 hours over the span of six days in late October and early November 2014. (Images before October 30 and after November 5 were too cloudy to make out anything in sharp detail.) In the above animated GIF, it’s possible to see the bright lights emanating from the new base for the Northern Fleet on the northeast corner of the island along with a number of ships moving in the waters just offshore. What appears to be 50 Let Pobedy sails around the islands before seeming to head north. Interestingly, some astronomical phenomena are visible, too: the aurora borealis also makes an appearance on October 31 and each image is subsequently brighter than the previous as the moon grows fuller each night. For comparison’s sake, we can see that in July 2013, a couple of months before the Barents Observer reported on the military activity at Kotelny Island, no lights were visible. By contrast, an image taken over the same area in October 2014 shows a bevy of lights both on and offshore. BEFORE: July 27, 2013: Lights out on Kotelny Island. AFTER: November 2, 2014: Ships and the base are lit on Kotelny Island. What are we to make of these satellite images? First, they simply show light. Remote sensing is all about indirect measurement and analysis. Since we’re not on the ground, we can’t say for certain that these lights are from military activities. But they may be a good proxy for them. This inference is validated by the news articles reporting on the uptick in military infrastructure and activity on the New Siberian Islands since September 2013. Second, more analysis of satellite imagery across the Russian Arctic in places like the Kola Peninsula, Wrangel Island, and Cape Schmidt is needed to determine whether a full-scale, region-wide military build-up is really taking place. Until then, all we can say for now from this short analysis of satellite imagery is that Russia is installing a lot of resources on Kotelny Island. Third, while Russia may be increasing the number of bases and personnel in its Arctic regions, it is not alone. The United States, Canada, Norway, and Denmark are all enhancing their northern military capabilities albeit to varying degrees. Rob Huebert, a political science professor at the University of Calgary, argued in the Canadian newspaper The National Post: “The militaries of most Arctic states are taking on new and expanded roles in the region that go beyond their traditional responsibilities, which may create friction in the region.” He even believes that the Arctic Council should begin talking about militarization, which is currently barred from the discussion table. Lastly, what the satellite imagery doesn’t show are the actual sources of the lights. One of those sources may be a small onion-domed house of worship, of all things. Earlier this month, the Russian Military published a story on its website concerning a new Russian Orthodox chapel on Kotelny Island, which was opened just in time for Orthodox Christmas on January 7. Northern Fleet servicemen on the island can now worship at this small chapel. Priests from Tiksi, a settlement on the Russian mainland not far from the New Siberian Islands, will visit from time to time. Soldiers and priests in the Russian Arctic? 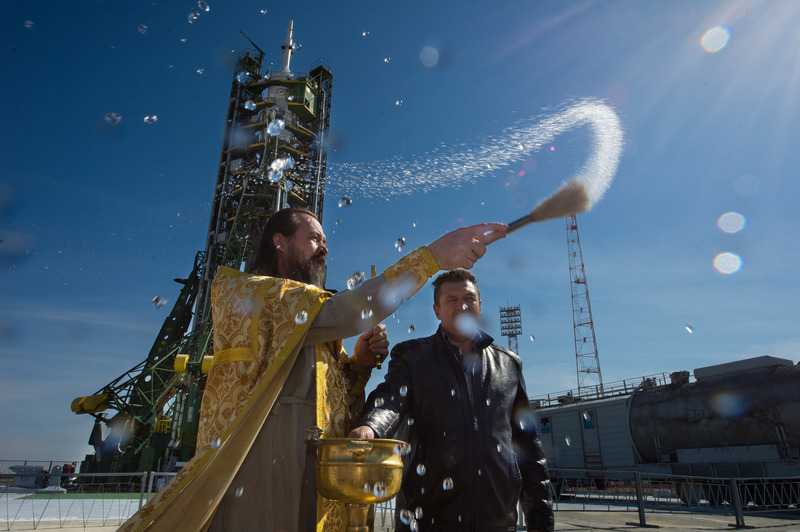 That’s one big difference between contemporary Russia and the atheist Soviet Union.